This badge holder has demonstrated their knowledge and expertise as a Speaker who has presented to a large group at the Fall 2018 CCCAOE Conference. As a panel presenter, they have been recognized for their understanding of their subject area and for contributing to the Conference: "Career Education: Leading Change." 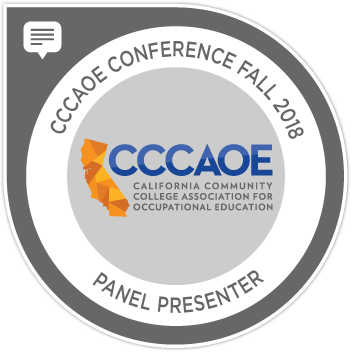 As a Panel Presenter, they spoke and presented to a large group of California Community College professionals at the CCCAOE Fall 2018 Conference. Submitted their prepared materials (presentation slides and handouts) to CCCAOE.